Riga was built by German crusaders and early buildings and churches were put up in a Romanesque and Gothic styles which German craftsmen and Cistercian monks brought from Northern Germany. By the end of the 15th century Riga had aquired a metropolitan style which was characteristic to all of the cities in the Medieval Hansiatic league. The city’s skyline of three Church steeples as it was known became a true visiting card to what was then the capital of Livonia. 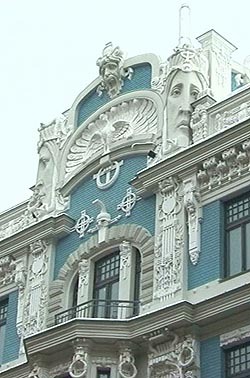 Many call Riga - Europe’ s capital of Art Nouveau. The most distinguished street is Alberta Street, which is laid exclusively with picturesque Art Nouveau buildings designed by such master architects as Mandelstahm, Pēkšēns and Eisenstein, the latter an architect whose son went on to become the world famous film director - Sergei Eisenstein. Alberta and Strelnieku Streets comprise the biggest gallery of Art Nouveau architecture in Riga. Many buildings have still not been renovated and you can still venture into the beautiful although neglected hallways. Of particular interest are freshly renovated buildings of the Stockholm School of Economics and Law, as well as the head office of the Latvian anti-corruption police KNAB. People have occasionally called Riga little Paris while Napoleon once referred to it as a suburb of London. This may be because Napoleon never conquered London or Riga. Latvia’s capital put the torch to all of the wood buildings in its outlying areas in order to prepare for Napoleonic attack. In fact this laid the groundwork for a new phase in Rigensian architecture. The wood buildings gave way to the stone structures which form the present face of the city. Church of Maria-Magdalen is the only building that survived of the former Cistercian Nunnery (1255 - 1582). The church has been rebuilt and renovated in 1746. The first new style living house in Riga built in 1685. This is the most beautiful merchant living house in Riga, a wonderful monument of Baroque. The Academy of Arts is a building combining synthesis of Neo-gothic and Jugendstil. This is the best-known project by architect W.Bocksalff. Alberta Street carries the name of the man who founded Riga. Now it is one of the most beautiful and splendid streets in the city, representing all that Jugendstil can offer. This building, first mentioned in 1344, built in Gothic style, was a seat of single merchants belonging to the Merchants' Guild. The Dome school was established in 1211, pupils were taught in Latin and all the teachers were priests. Great Guild was originally Merchants' organization dated with 1354, its members were German merchants. In November 18th, 1918 the Republic of Latvia was proclaimed in this building. The building was created by J.Baumanis, the first professional Latvian architect, in 1869. The present building of Small Guild was built in 1864-1866. Now a culture house "Guild" is situated there. Cinema 'Splendid Palace' (1924), now cinema 'Riga', used to be the most beautiful cinema in the city. St. George church is the oldest building in Riga. It was founded in 1202. The Mentzendorff's House is the architectural monument from the 17th and the 18th century. The name was derived from the last owners of this house - the Mentzendorffs. This is one part of the former fortification system, surrounding Riga. It was first mentioned in 1330 and it was originally called Smilsu Tornis. Now the Latvian War Museum is situated there. The Museum was founded in 1773. It is one of the largest and the oldest museums in Latvia, as well in the Baltic states. The building of the city art museum has a long history. This is the first building in Riga created specially as a museum. Swedish Gate is one of the most interesting constructions in Old Riga. It belongs to the former fortification wall surrounding all of the Old City. The oldest dwelling houses in Riga. With the pediments facing the street these houses present the main principles of medieval building manner. Lutheran church built in 1704 near the lake of Usma (close to Kuldiga town) was moved to Open-Air Museum in 1935. The Brothers' Cemetery - analogue of which is hard to find in Europe, is devoted to the memory of those who fell during the I and the II World War. This building with a cat on top was originally designed as an insult to enemies across the street. The foundation stone of the Dome was laid in 1211, when Bishop Albert had a great plan of building a church, a monastery, some more buildings to present the power of Catholic church in Riga. St. Peter's Church is one of the most significant and beautiful Gothic churches in Riga and the Baltic states. Built for the Order in 1330, Riga Castle served as the seat of the secular power for a long time. Now the President of Latvia has his residence in the castle. The beginning of the church was dated at the end of the XIII century, when the Dominicans built a church for the necessities of a cloister.